A couple of years ago, when I was often troubled by injuries, the therapist at Dr. Canlas’ clinic taped me up and I learned about Kinesio Taping. I wrote about it HERE. Fortunately, through the years, I’ve wisened up (at least I’d like to think so) and with preventive care and management, I’ve managed to avoid getting injured again. But, last week, I felt my ITB tightening up…again. There is only one word to describe how I felt last week: STRESSED. I practiced caution and did all I could last week to nip this injury in the bud. First thing I did was to tape myself. As in the past, kinesio taping always works for me. I can honestly say it helps to relieve the tightness or the occasional soreness I get on my left knee/ ITB. As I type this, my left ITB is taped up. 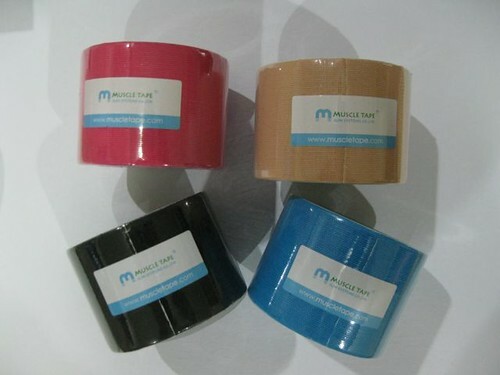 The past few months, I learned that there are several brands of tapes in the market, such as Kinesio Tex, KT Tape, and Muscle Tape. I had the pleasure of meeting the people behind MUSCLE TAPE and KINESIO TEX. The local distributor of Muscle Tape, Riel Banaria, and I met a few months back. He was kind enough to give me a box of colorful samples and pre-cut samples for the knee, neck, and other key areas of injury. I also met with Sanjo Gudalpas, the local distributor of Kineso Tex, and Jay Lopez, a licensed occupational therapist. They gave me a sample of Kinesio Tex Gold and we hopped on over to Runnr where Jay demonstrated how to apply the tape on my leg. Jay explained that Kinesio® Taping alleviates pain by lifting the skin. Pressure and irritation are taken off the neural and sensory receptors of the taped area of our body, which results in reduction of pain. 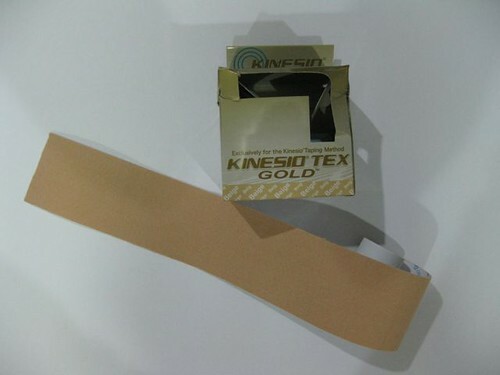 According to its website, Kinesio® Tex Gold is the authentic tape product made exclusively for the Kinesio Taping® Method and designed and authorized by Dr. Kenzo Kase himself (founder of the Kinesio Taping Method). It is used to re-educate the neuromuscular system, prevent injury, alleviate pain, enhance performance and promote improved circulation and healing. – comes off easily – While these tapes are said to come off in 3 to 4 days. Muscle Tape slowly peels off in one day. The edges of the tape gradually unravel and fray, which is inconvenient especially if it starts sticking to your pants or shorts. – effective – Compared with Muscle Tape, I thought the quality of the tape was much better. I felt like this tape was stronger and tugged a bit tighter on the skin. 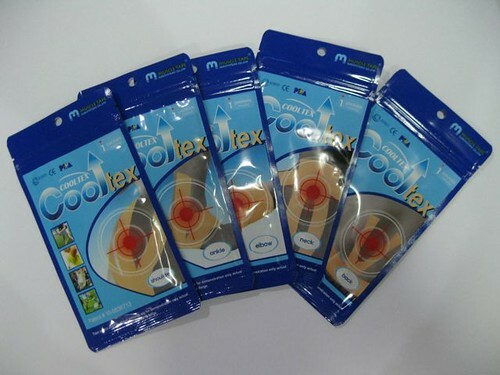 My personal choice would be Kinesio Tex Gold for its effectiveness, high-quality, and durability. But, if you’re on a tight budget, Muscle Tape will still be effective without burning a hole in your pocket. Experts are still undecided about the real benefits of Kinesio Taping. I know Dr. Canlas uses Muscle Tape in his clinic. Coach Jim Saret says there is no scientific evidence to prove it works. For me, I know it’s been effective so I continue to use it and recommend it to injured friends. Should you decide to try taping, it’s best to consult a doctor or have a licensed therapist show you how it’s done. Muscle Tape – Precuts – P120 | Rolls – P630. Available at Runnr, all Tobys Sports, all Chris Sports, Landmark Department Storem Juego Sports and Sports Hub. Our costumers are very happy with Kinesio Tex Gold because of the glue, which is far better than the KT Tape. NICE BROOKS RUNNING SHORTS! NIKE – BOOO! HAHA! I’M GLAD A LOT ARE TRYING NEWER BRANDS THAT AREN’T INTO MASSIVE SWEATSHOPS..
might try this one if my itbs acts up again. It was great to attend the first Bull session!